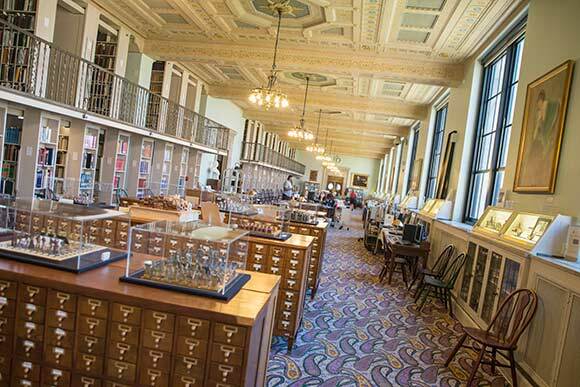 The Cleveland Public Library (CPL) will celebrate its 150th anniversary year in 2019, and already a campaign has started to develop bricks-and-mortar updates, re-imagine some popular spaces and make plans for the next 150 years. Founded in 1869, just four years after the end of the Civil War, CPL was a tenant in several downtown locations before building its own Beaux Arts building designed by the architectural firm Walker & Weeks. The Main Library building at 325 Superior Ave. was dedicated in 1925, making this its 90th anniversary year. Consequently, this may be the ideal time to get reacquainted with some of the captivating charms of the venerable grand dame. Here are seven CPL gems that any fan of Cleveland – and the library – should get to know or re-discover. References to literature, history and classic mythology are in abundance throughout the artwork and fixtures at the library, especially in the main lobby, where there is a lamp carved into the wall above the Brett Memorial Hall. The theme repeats itself in the window grills by the main door, the matching torchieres, and the restored 1926 terrestrial globe above the entrance. A lamp illuminating the way to more education and wisdom, is emblematic of the library’s past and present philosophy. In 1890, William H. Brett, the third director of the library, made CPL the first major metropolitan library to adopt the “open shelf plan,” which allows patrons to browse through the books aisle by aisle. The main entrance level and all the floors of the main branch were updated in a huge renovation between 1997 and 1999 under the director of Robert P. Madison International. Original artwork and fixtures were cleaned and repaired, and new technologies added behind the scenes, so the library embraces the best of the old and new worlds. When you go: Don’t miss the grandeur of Brett Hall, 112 feet by 38 feet with 44 foot ceilings overhead. Look for the murals too – one from the Works Progress Administration (WPA) era. Much like the library itself, the Special Collections on the third floor offers intriguing treasures. One standout is The John G. White Collection of Chess – the largest library collection of chess sets and chess-related materials in the world. On your way to the chess collection, you might pass the display of a decade’s worth of playbills from the Cleveland Play House, currently celebrating its 100th anniversary. The library is also celebrating the 150th anniversary of the publication of “Alice in Wonderland,” with memorabilia and rare books related to the classic as well as Lewis Carroll. Then there’s the Schweinfurth Architecture Collection, with original drawings, blueprints and renderings for some of Cleveland’s most historic buildings such as the interior of the Old Stone Church, the four landmark bridges over MLK Jr. Drive in the Cleveland Cultural Gardens, Trinity Cathedral, and private homes including the Mather home in Bratenahl, now the Shoreby Club. Special collection librarian Pam Eyerdam, will rock your world with her depth of knowledge and enthusiasm for the special collections. Ask her about the Anisfield-Wolf collection, which offers all the books honored by the annual award, which recognizes works addressing issues of racism and diversity. The list goes on: a folklore collection, the miniature book collection, rare books and manuscripts – not to mention the early children’s books, or the Roll of Honor books from WWII. When you go: On your way to Special Collections, you’ll pass through the John Griswold White Collection Exhibition Corridor. Look for the owls (another symbol of wisdom) in the wrought iron display cases. If the past just isn’t your thing, venture onward to the lower level where all things techie abound in TechCentral. There’s the legion of desktop computers consolidated here. There’s the iPad lending station that looks like an overgrown vending machine. Go ahead and borrow one, and use it anywhere in the main building. Then there’s the 3-D printer, which makes solid, three dimensional objects from a digital file. Other technologies patrons may borrow include the vinyl cutter, which precisely cuts the outline of a picture or letters for use in signs, artwork or decoration. With the heat press patrons can create their own custom t-shirts. Using these tech toys is free. There is a modest fee for materials. In this tech wonderland there’s also a guitar connected to a computer to create digital recordings. CPL offers a series of MakerLab workshops at the main and branch locations every month on topics ranging from virtual drawing circuit building. These workshops are hands-on, and are open to anyone who wants to learn a new skill. When you go: Inspect and be inspired by the samples of 3-D printing. Every year the Library Journal Index of Public Library Service rates libraries across the country. The scores are based on four per capita statistics: library visits, circulation, program attendance and public internet computer use. The numbers are crunched considering the size of the population and the amount of money the library has to spend. The process has been around since 2008, and almost every year CPL rates five stars (sometimes four) indicating its commitment to service and programming. Northeast Ohio is ridiculously rich with four and five star libraries, which include the Lakewood, Hudson and Cleveland Heights systems. Overall, Ohio has 27 all-star libraries -- beat only by New York State with 36. In the library universe it is not typical for a large urban system with 20-plus neighborhood branches to consistently rate four or five stars, yet CPL has been on the list every year. Keep an eye out for: the next rating for US libraries, announced in November. 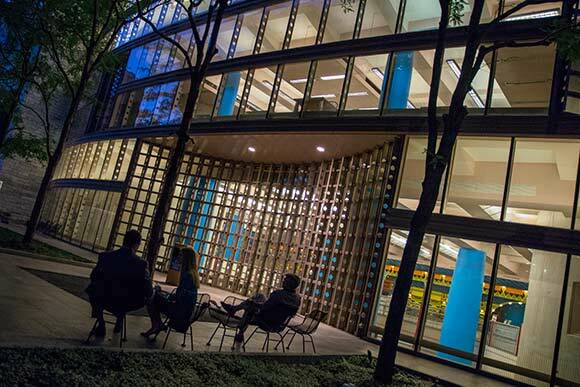 Named in honor of Linda Eastman, CPL director 1918-38, the Eastman Reading Garden is a sliver of green space nestled between the main library and the Louis Stokes Wing at 525 Superior Ave.
A garden in the library’s prominent downtown location is no accident. As far back as 1903, three nationally-acclaimed architects, Daniel H. Burnham, John M. Carrère, and Arnold R. Brunner, had an idea for city planning that almost no other U.S. city had. The trio’s plan was inspired by the 1893 Chicago World’s Columbian Exposition, which espoused new ideas regarding urban planning and design. Dubbed The Group Plan, it actually came to fruition in Cleveland with seven government buildings – all with matching classical architecture, height and complementary materials. The garden was always part of The Group Plan – as a park. But under Eastman’s guidance the park became a reading garden, and instantly popular from the moment it was dedicated in September 1937. Time has not diminished the garden’s popularity. Permanent artwork enhances the urban calm. Newer fixtures include the L-shaped reflecting pool by sculptor Maya Lin and poet Tan Lin. There’s also the bronze gate by artist Tom Otterness, with its fragmented alphabet and whimsical characters hoisting letters into place, and more characters throughout the garden, on a windowsill, and perched on a tree planter. Non-permanent artwork finds its way into the garden as well. Currently “Migration” by Andrea Keys Connell is in place, a sculpture that suggests the immersion and adventure of reading. The popularity of the garden with its greenery and art is not lost on library innovators. CPL is starting to articulate plans to convert a first floor area in the Stokes wing into an indoor reading/reflecting garden. When you go: Look for the title of the reflecting pool/sculpture “Reading a Garden” as an actual reflection in the water. From its earliest days, CPL has been a trendsetter in public interaction and offerings. The floor plan introduced by Brett soon became the standard for libraries across the country. Another innovation – a first for an American library at the time – was the configuration of the reading rooms. Book stacks were placed in the interior of the room, with seating for readers and researchers on the outside of the room and windows with views on the sides. 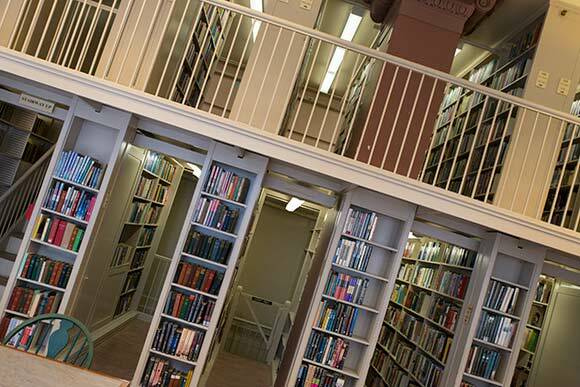 Additionally, the reading room completely surrounds the open stacks – both floors of them - to allow the open shelf plan to work more efficiently and allow the books to be closer to the reader. More traditional, but no less innovative are the hundreds of programs available at the branch and main libraries throughout the year. These include the Writers and Readers series and the Lockwood Thompson Dialogues. There’s free, online learning on topics from accounting to personal development. There are children’s story hours – some offered in Russian and Chinese. Then there’s the Graphic Novel Speaker Series; book clubs; free concerts from Cleveland Institute of Music students; and free writing workshops. The list is exhaustive. When you go: Sign up for CPL’s on-line newsletter. Just so you don’t miss anything. “Bad libraries build collections. Good libraries build services. Great libraries build community.” So says Thomas, the library’s 14th director. 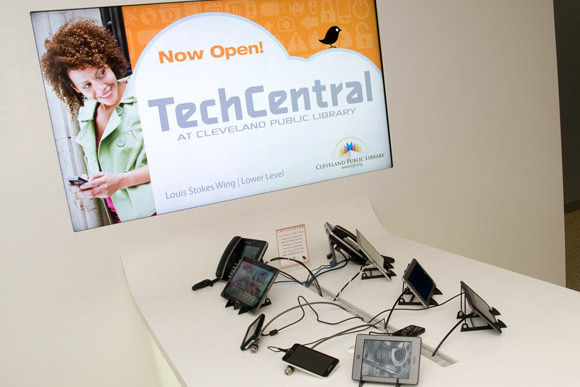 His vision is for the library to help create a more prosperous future for Cleveland and its residents by combating community deficits – the digital divide, illiteracy and unemployment – with innovative programming and action at all the branches. Thomas would know. Growing up in a neighborhood devastated by gang wars, with only churches and the library left standing, Thomas opted for the library to stay off the street. At age 13 he became a page, and the youngest employee of the Las Vegas-Clark Library system. Thomas earned his undergraduate degree from the University of Nevada, Las Vegas, and a Master’s in library science from the University of Hawaii. He is currently a Ph.D. candidate in managerial leadership at Simmons College in Boston. Along the way Thomas became a musician – a drummer -- and therefore is sometimes referred to as a “drum major for change,” leading the library in ways they didn’t think they could achieve. Now the CPL looks ahead to the next 150 years through 2165. CPL150 is strategic plan for how the library can be active in people’s lives. The groundwork has been set through current activities. “The planning is about balancing GEDs and Ph.Ds, three-year-olds and 83-year-olds – so there’s something for everyone, services for everyone.” Thomas says. This fall CPL will begin marketing the main library as a major downtown attraction, inviting everyone to step inside the massive main doors and take a look around. Additionally, in the coming months look for CPL to begin renovations at the South branch, 2704 Clark Ave.
CPL150 is an outline for the library system that will serve our great-grandchildren, and their children. In 2015, we will only be able to see the very first initiatives. Possibly the most exciting project among them is creating a new Cleveland Public Library branch for University Circle.